Potassium regulates fluid balance in the body and promotes normal muscle function, including helping to regulate. heart beat. It plays a key role in metabolism and nerve impulse transmission and prevents and treats high blood pressure. Jamieson Laboratories formulates its potassium only with organic gluconate, which is the same form of potassium found in food. This high-potency supplement is especially suited to individuals on diuretic medications and high protein/low carbohydrates diets where the risk of potassium depletion is far great. Time-released, this formula allows the body to gradually absorb the essential nutrient over six to eight hours. Potassium (Potassium Gluconate) 100 mg; Derived from organic potassium. The time diffused microencapsulation provides active potassium for 6-8 hours. Excipients: Dicalcium Phosphate, Water-Soluble Cellulose, Cellulose, Polyethylene Glycol, Sorbitol, Vegetable Magnesium Stearate, Brazilian Palm Tree Wax, Vegetable Stearic Acid. I have been taking Potassium and many oher vitamins & meds of different sizes and shapes for many years. These pills are huge! (horse pills), though coated for smoother swallowing, they are quite difficult. Have had to take this product for years now and find it works much better in it's timed-release form. However, the pills are so large, I'm starting to have a few problems swallowing them, even when cut in half. I was already low in potassium, so I knew I would benefit from the pill. However after doing some research, I also found that it helps with restless legs. BONUS! I need potassium daily and I find the timed release works better. Just wish the pills weren't so large! Definitely helps my restless leg syndrome when i take it before bed. I find the size of the pill a bit large. I do a lot of juice fasts and this is the only supplement I found that eliminated my leg cramps. I have been taking potassium for blood pressure, BUT have found another benefit. Taking extra potassium is helping to eliminate extra fat . My apron has dropped about 2-3 inches, certainly feeling better. Potassium is balancing salt in my system releasing water from fat cells. Finally something is actually working to make be better. Because of other medications that we take, both my husband and I are supposed to take extra Potassium and you can only eat so many bananas and so much broccoli! It is often very difficult to find this product on store shelves (don't know why) and so we appreciate being able to purchase a quality product from Well.ca at a reasonable price and good service delivery. This is the only potassium product that eliminated nightly leg cramps for both myself and my husband. It is very difficult to find the 100mg time release version on drug store shelves. We highly recommend this product for anyone who suffers from chronic muscle cramps. 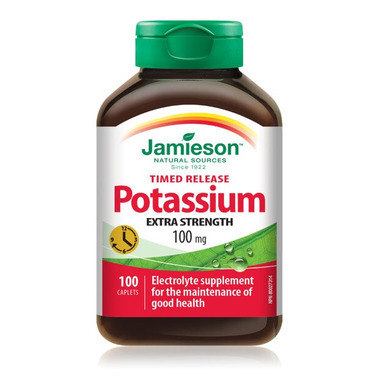 It's very difficult to find Potassium 100mg Timed-Release on the shelves of drug stores. Stores usually only carry Potassium 50 mg. In my opinion the timed-release form is the best and provides the most benefit.